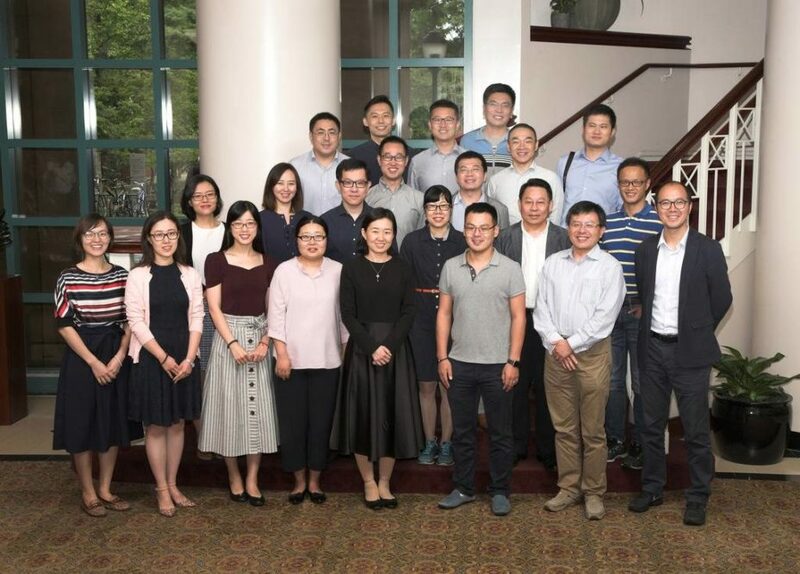 On Sunday, August 19, Classroom by WRDS was introduced to invited scholars from China-based institutions as part of the inaugural WRDS Advanced Research Scholar Program, a six-day series of sessions on Wharton’s campus exploring big data led by the WRDS doctoral-level research directors, Wharton faculty, and guest presenters. The program was designed for scholars who are interested in gaining an in-depth understanding of empirical research practices and insight into the latest innovations in academic research. A wide range of topics were presented during the sessions, including advanced research trends, analytics, and presentations from Best Paper Award winners. During the Sunday session, Mukund Rao, financial solutions architect on the WRDS Advanced Initiatives team, reviewed their ongoing process to democratize data use cases, and how those fit into their university’s classroom. The inaugural class of invited scholars from China-based institutions who participated in the WRDS Advanced Research Scholar Program. WRDS is a globally recognized data research platform with more than 50,000 commercial, academic, and government users across 35+ countries. Among the thousands of users are faculty and PhD students from institutions who, through WRDS, have access to leading and specialized databases, including S&P Global Market Intelligence, CRSP, NYSE, and Thomson Reuters. Classroom by WRDS launched in the summer of 2016 with the goal of helping faculty introduce finance and business concepts. It started by offering a few basic tools in the investments and accounting spaces. By the end of this year, 50 different tools will be accessible through the WRDS website, ranging from how-to’s on using the service, to simplified queries for learning, to interactive apps and simulations — including resource, OTIS, Wharton’s Online Trading and Investment Simulator. WRDS classroom tools offer both longer-term engagement (OTIS) as well as stand-alone lessons with teaching notes and slide decks that can help instructors erase the hassle of crafting teaching aids themselves. The WRDS team created three interactive web applications with John B. Neff Professor of Finance Donald Keim to integrate into his Wharton investment lectures. “I worked very closely with Don to replace spreadsheets he was showing in class,” Rao said. WRDS users download teaching tools from the site, with accounting and investments, macroeconomics, and text analysis being the most popular. To make their data more classroom-friendly, the initiative has developed tools that simplify complex research queries while still keeping numbers authentic. For more active student engagement, there is OTIS, a simulator created by Marshall E. Blume, the Howard Butcher III Professor Emeritus of Financial Management at Wharton, that runs on real-time market data and fosters healthy competition through financial portfolio rankings. A part of the WRDS subscription, OTIS has also been serving as a foundation for the global Knowledge@Wharton High School Investment Competition. According to Rao, it’s useful in the classroom as more than just a stock market simulator. Chinese instructors, for example, can have their students trade in the Shenzhen or Shanghai exchanges, and choose to turn off options like short selling and margin trading to restrict what their students can do. In the new version of OTIS to be released next year, trading will be instantaneous. “We like to engage with both the students and instructors. It’s very helpful for us to get feedback,” said Rao, who encouraged instructors to reach out to WRDS with suggestions and concerns. “That doesn’t just apply to OTIS — that applies to the whole classroom initiative.” New tools for bonds and fixed income, marketing, and corporate finance, he added, are currently in progress. Wharton Research Data Services (WRDS) was developed in 1993 to support faculty research at Wharton, and has since become a leading provider of business intelligence for over 450 institutions in more than 35 countries. Users have access to cutting-edge analytics, research tools, and high-speed, flexible data delivery options. Through its in-house analytics team, doctoral-level support, and rigorous data review and validation, WRDS enables users to tailor research within complex databases and create a wide range of reliable data models. It is designed to improve research efficiency and speed by allowing them to access more than 350 terabytes of data across multiple disciplines, including accounting, banking, economics, ESG (environmental, social, and governance), finance, health care, insurance, marketing, and statistics. WRDS is also a leader in impactful research. Through a partnership with SSRN, WRDS is elevating the visibility of universities and researchers working across an array of fields. The WRDS Research Paper Series is a searchable repository of all papers submitted to SSRN that cite WRDS in their work. In addition, the two organizations have launched the WRDS-SSRN Innovation Award to honor emerging business schools in North America, Asia-Pacific, and Europe, Middle East, and Africa.